Below is a list of unigenes available for Fragaria vesca. Click the unigene name for further details. Fragaria vesca is the diploid strawberry species with the widest geographic distribution, comprised of four subspecies. In the Americas, F. vesca is represented by ssp. americana (N. America, east of the Rockies), F. v. ssp. bracteata (Pacific Northwestern N. America, Rockies and westward, and into northwestern Central America), and F. v. ssp. californica (California coast). The fourth F. vesca subspecies, ssp. vesca, is European, distributed on the continent and eastward to at least Lake Baikal. Within F. v. ssp. vesca, both wild and cultivated forms exist. The wild forms display the typical strawberry features of red fruit, stolons (runners), and seasonal flowering. Small scale (mostly home garden) cultivation of F. v. ssp. vesca is focused on the so-called ‘semperflorens’ or ‘Alpine’ forms, which exhibit perpetual flowering and among which are also found runnerless and/or yellow-fruited forms. Perpetual flowering, runnerless, and yellow fruit color traits are each monogenic recessives. The three corresponding responsible genes are located on separate chromosomes and assort independently. The first instances of genetic linkage in strawberry were reported in F. vesca in 1995, each involving a morphological trait and an allozyme locus. Due to its favorable qualities including self-compatibility, abundant seed production, small plant size, diversity of forms, amenability to in vitro manipulation, and small genome size (1C = 240 Mbp), F. v. ssp. 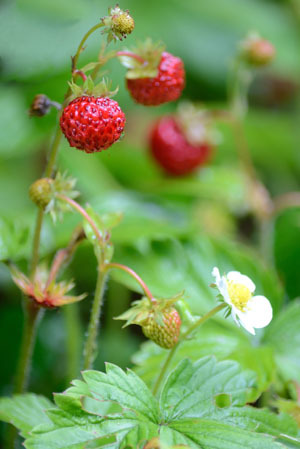 vesca f. semperflorens has attracted the investment of the international strawberry research community into the development of genomic resources, thereby establishing a diploid model system for strawberry. Moreover, F. vesca is a subgenomic contributor to the genomes of the octoploid strawberry species, thereby providing a relevant and genetically/genomically simple alternative as compared with the respective complexities associated with octoploidy. For genomic resource development, particular examination was given to a seedling-derived clone named F. vesca ssp. vesca ‘Hawaii 4’. This runnering, yellow-fruited, semperflorens clone drew initial interest due to its responsiveness to in vitro regeneration and Agrobacterium-mediated transformation procedures. In 1997, the first strawberry genetic linkage map was constructed in F. vesca, using the progeny of a cross between F. v. ssp. vesca f. semperflorens ‘Baron Solemacher’ and F. v. ssp. americana ‘WC6’. The Hawaii 4 genome sequence was published in 2011 (V 1.0), revised that same year (V 1.1), re-annotated in 2014 (V 1.1.a2), and revised again in 2014 (V 2.0.a1). The Hawaii 4 genome assembly has become in indispensable and invaluable tool for strawberry genetic/genomic research, and was the reference genome used in the SNP discovery process leading to the design and commercial release of the Axiom® IStraw90® strawberry SNP array in 2015, a new and important tool in support of marker-assisted breeding efforts in the cultivated strawberry.